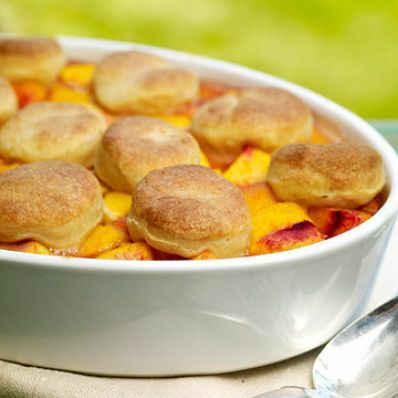 Reduced-fat sour cream is the secret ingredient in the biscuit topping for this nectarine dessert. 1 of 1 Heat oven to 375 degrees . Coat a 2-quart baking dish with nonstick cooking spray. In bowl, combine nectarines, sugar, cornstarch and nutmeg. Pour into dish. 1 of 3 In a large bowl, stir together the flour, baking soda and salt. In a small bowl, whisk together the sour cream, egg, butter and 1 tablespoon of the sugar. Stir sour cream mixture into the flour mixture until a dough is formed. 2 of 3 On a lightly floured surface, pat or roll out dough to 1/3-inch thickness. Using a 1-3/4-inch round biscuit cutter, cut out 6 biscuits. Gather dough together and repeat for a total of 12 biscuits. 3 of 3 Place biscuits on top of fruit mixture, spacing evenly over fruit filling, and brush with milk. Sprinkle with remaining 1 tablespoon sugar. 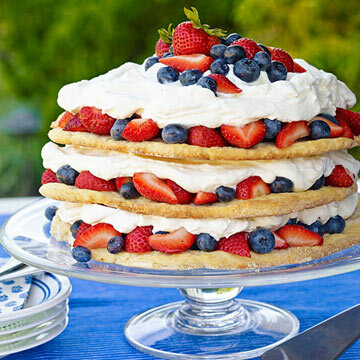 Bake at 375 degrees for 35 minutes, until biscuits are browned and fruit is bubbly. Cool at least 15 minutes before serving.